Are you looking for a way to jump start the rest of your career? 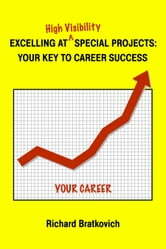 Your career progression depends (more than you think) on your ability to perform special projects. This booklet tells you (1)how to perform special projects on-time with excellent results, and (2)how to avoid career damaging pitfalls. This unique material has generated proven, positive results in a Fortune 500 company.